The lunch itself was nothing spectacular - a simple dish at the Wimpy in Rosebank. But the fact that the Wimpy was not able to serve me a Coca Cola because they were out of stock (or their fountain was dry?) was a sign that this was part of something bigger. 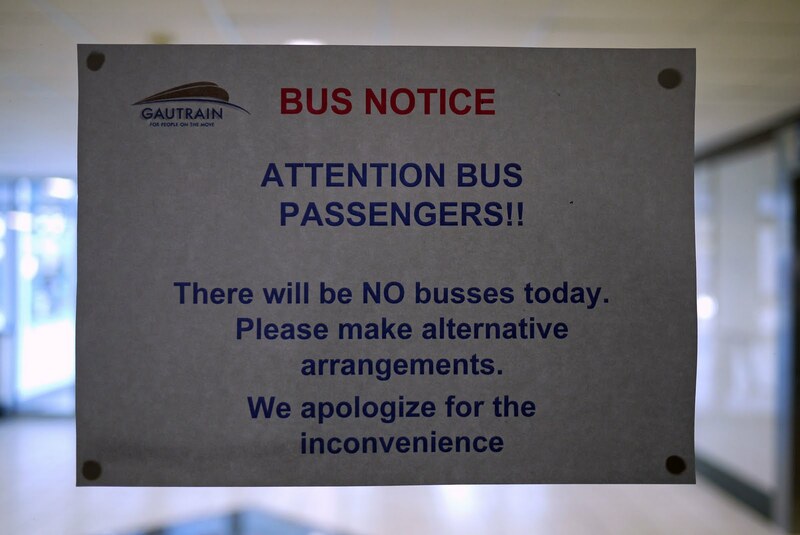 Gautrain affliction is taking on epidemic proportions and I too fell victim to it. Let's start with the basics for the uninitiated. 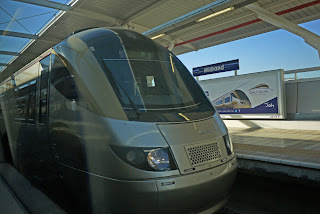 The Gautrain is a new high-speed (160km/h) train connecting Johannesburg and Pretoria (and the OR Tambo Airport). It therefore connects the two primary cities of the Gauteng province with one another and both with the province's (and South Africa's) primary airport. 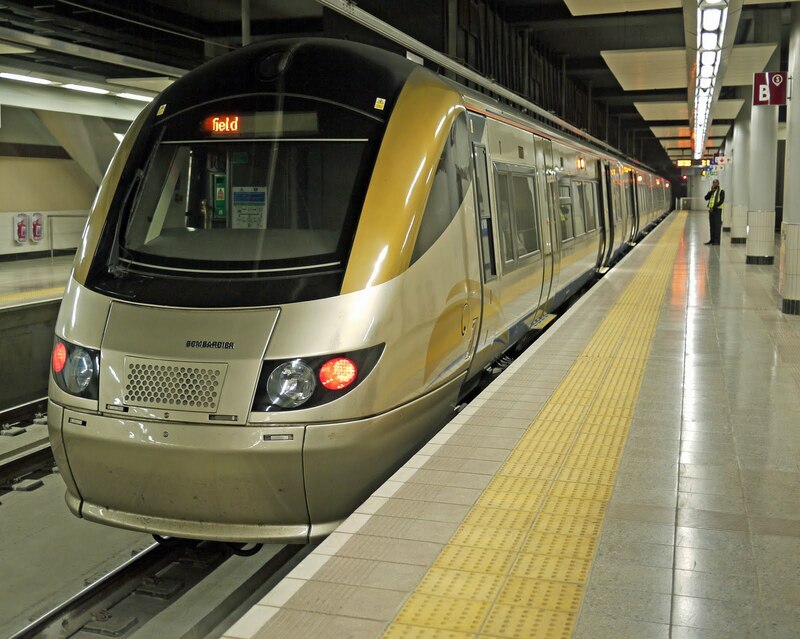 The name Gauteng is the seSotho word for place of gold, and the Gautrain is set to become the core of the province's transport infrastructure. Its gold livery was therefore an obvious choice. 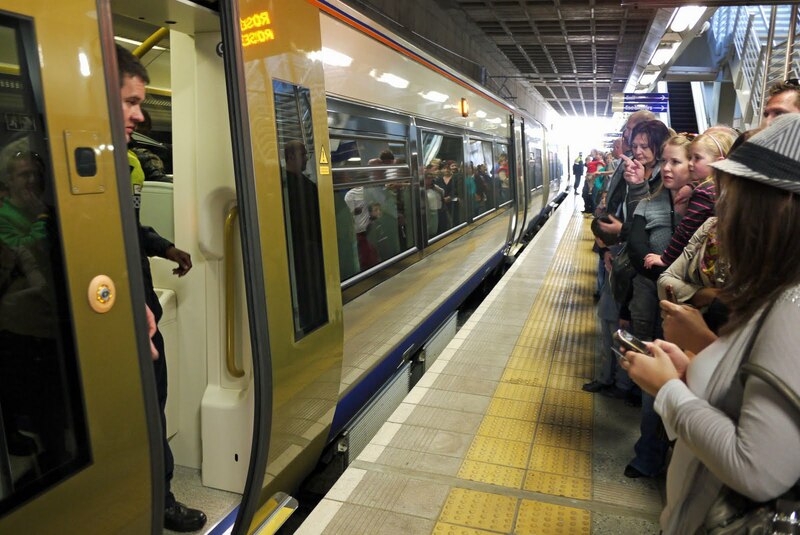 The train has been operating on the Sandton-airport line since last year's Soccer World Cup - and everyone who has had the chance has gone for a joyride. 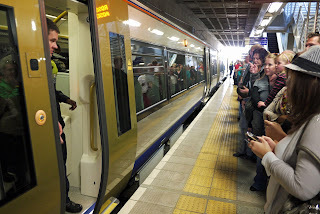 But we were really waiting for the Johannesburg-Pretoria line to open. However, some unforeseen drainage problems (or rather, potential problems) delayed opening this line. 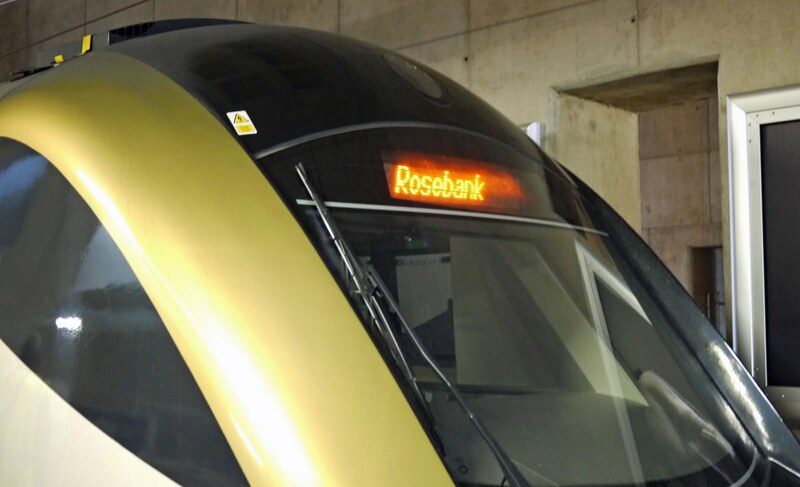 Eventually it was decided to open it, but only let it run to Rosebank in the South - one station shy of its eventual terminus at Johannesburg's Park station. The line was opened last Tuesday - so, to ride it in its first week one had to get on it by today. On the one hand it worked out quite well because this weekend is, for all practical purposes, a long weekend: tomorrow is Women's day and schools are closed today. So, I decided to use my opportunity today. Unfortunately, so did millions of others. Actually the crowd control at Hatfield station was quite impressive - the sort of crowd control that would have done Disney proud. The crowd was split into groups and groups were allowed to proceed to the next waiting area as other groups moved forward - all very smooth and disciplined. Since Hatfield is the northern terminus of the line they even ensured that the train was not filled to capacity here, so that others could board at the following station. 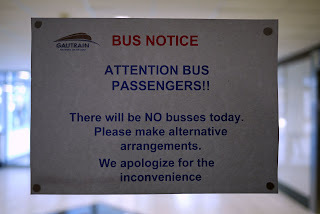 The fact was that the majority of passengers were going to Sandton (for lunch), so nobody was getting off to make space for others. I heard some mumbling and grumbling in the crowd, but this was one of the best examples of crowd control that I have yet seen in South Africa. 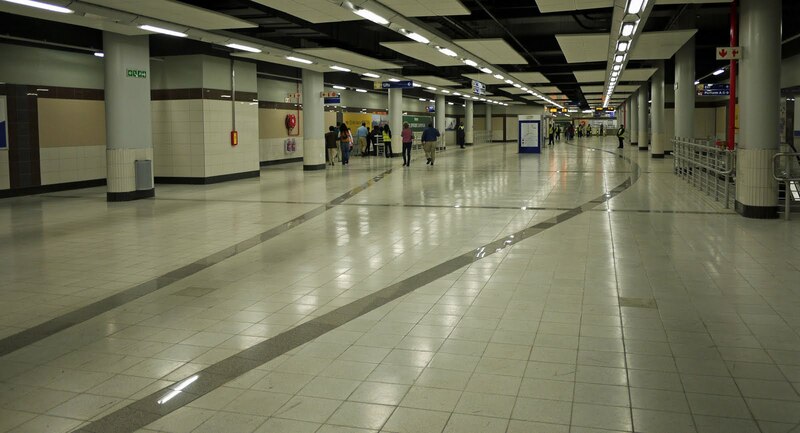 Not only the trains are impressive - the entire infrastructure looks good (and clean!). There was one sour note. The bus drivers (driving the feeder buses) started striking today. Apparently so did the spellcheckers. What defines a bus passenger if there are no busses [sic]? One sight that is now common, but will soon hopefully disappear is trains going to Rosebank. One of these days they will go to Johannedburg! While I was not able to ride the train last Tuesday, I was able to walk over to the University of Pretoria fence to take the picture below. Being so close, the Gautrain is bound to impact on how we do things.